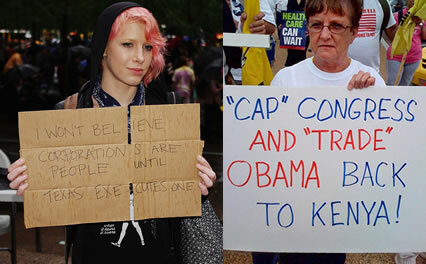 Occupy Wall Street (OWS) has drawn countless comparisons to the Tea Party. Both have arisen out of discontent with the current political system and have attracted followers from opposite sides of mainstream party lines, in addition to many independents. However, it would appear (given economic history) that the Occupy Wall Street protesters are angry for the right reasons (and have racked up impressive endorsements from people like Suze Orman and Howard Buffett and whereas the Tea Party is angry over their misguided notion of taxes and government (driven far more by ideology than objectivity). Both camps claim to want “take the power back.” But whereas the Tea Party has a simplistic “taxes and government are the problem” mantra we often see coming from the angry right, the Occupy Wall Street protesters realize that it’s corporate special interests that have filled the political power vacuum (a vacuum that exists largely because everyday people either haven’t participated in the Democratic process or, like the Tea Party, allow themselves to be blindly led by said corporate interests and unwittingly act against their own best interests). Whereas the Tea Party protests appear to be an 8-5 affair where protesters prop up (often racist) signs and speak out against government then go home (and enjoy their social security and Medicare benefits), the OWS movement appears to be a 24/7 affair, with protesters camping in public areas in financial districts. 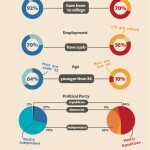 Occupy Wall Street is comprised predominantly of political independents (70%), who are young and educated. The Tea Party is predominantly comprised of Republicans (66%) who are older and wealthier and have favorable views of Sarah Palin, Glenn Beck and George W Bush. Tea party members are also likelier than the average citizen to believe that too much is made of problems facing African Americans and that Obama was not born in the United States. Occupy Wall Street protesters are angry that the wealth has gone to the top 1%, and that corporations have gotten richer while the average American has seen less and less fruits from their own labor. Well, they’re right. 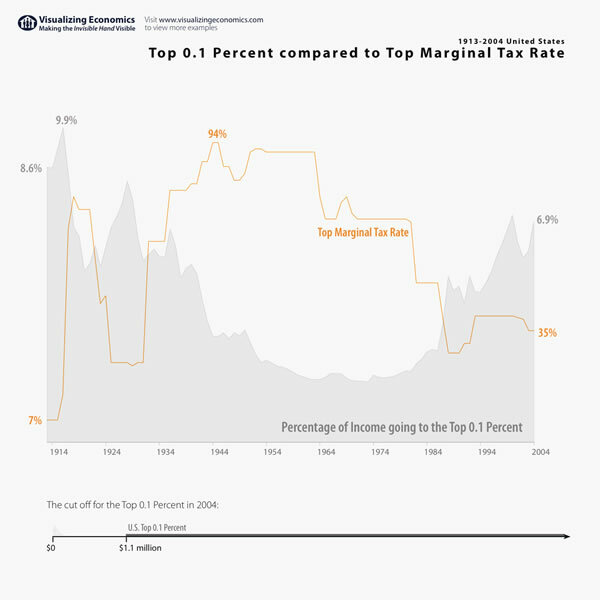 Most of the wealth over the last few decades has coagulated at the very top as taxes on the rich have been lowered and union-busting has largely dismantled unions and their ability to fight for living wages for workers. It’s a little-known fact that taxes on the highest earners were far higher from the mid-late 30’s until the late 80’s than they are today. 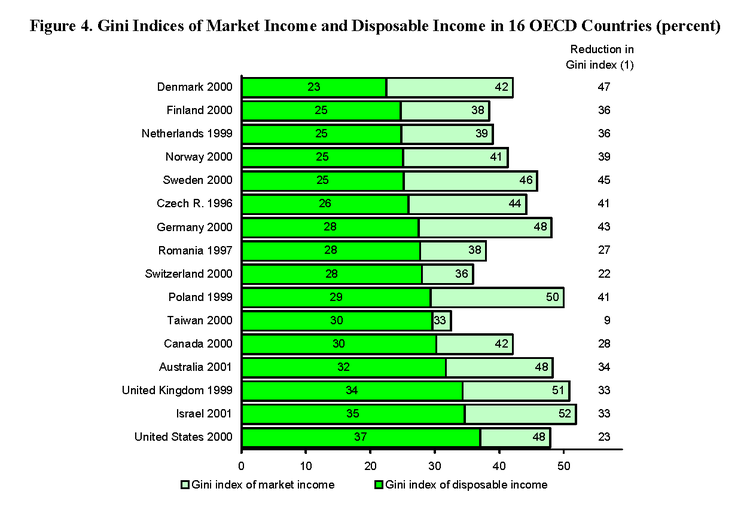 While income inequality certainly existed, it was nowhere near the levels we see today. Ironically, this is the era many fiscal conservatives generally long for (mistakenly believing that taxes were lower and unions were weaker). 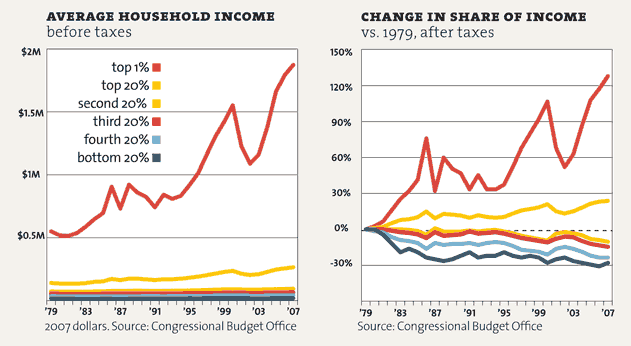 Likewise, the lowering of corporate taxes has only met with more hoarding of wealth. 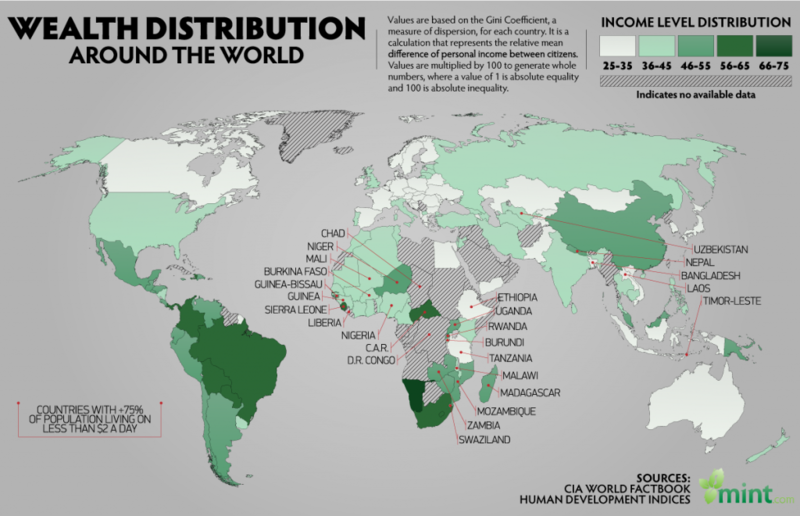 And this disparity between the rich and everyone else is far more prevalent here in the United States than in other industrialized nations. The Tea Party: Angry for the wrong reasons. The Tea Party is angry about taxes and the size of government. Unfortunately, a study by Forbes shows they are grossly misinformed on both subjects. Both taxes and government are smaller in the US than in other advanced nations. Whether one believes the US government is “too large” is a matter of subjectivity and open to debate. But regardless of one’s normative beliefs on this, the US federal government is actually small (as a percentage of the economy) compared to other advanced nations. And in fact, economic mobility has fallen behind in the US. The “American Dream” of transcending the socioeconomic status one was born into seems to have moved to Europe (see full report (PDF)). 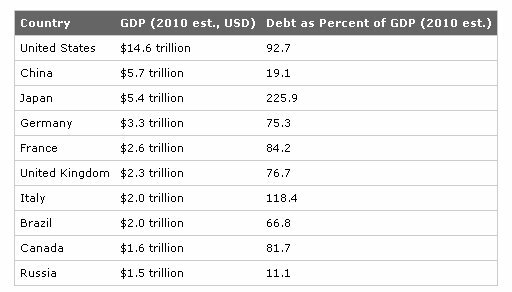 Here is a comparison of debt as a percentage of GDP for many of the nations above. 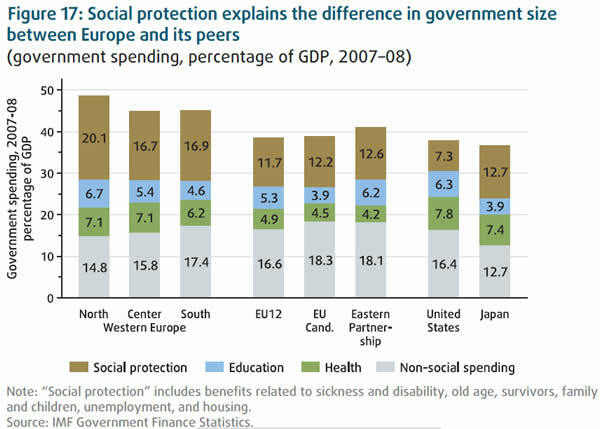 As you can see, there it’s difficult to argue that they are somehow worse off than the US financially. They are angry at the sudden rise in taxes. 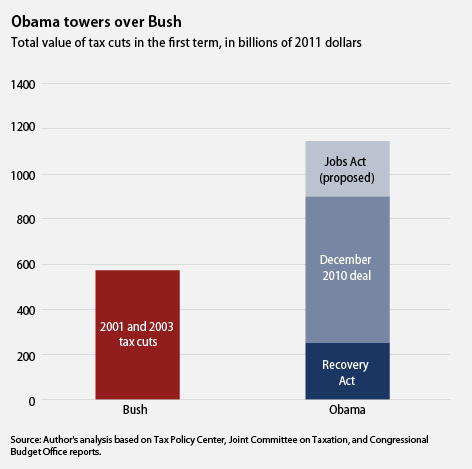 But in fact, Obama has actually enacted more tax cuts than Bush so far. 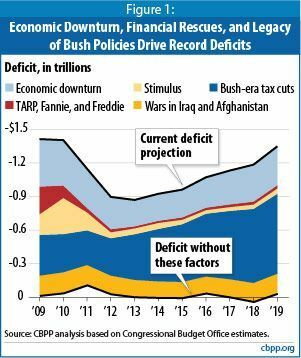 Naturally the Tea Party is angry about the debt: but the debt is a result from lost revenues from the Bush tax cuts and the economic downturn. Many have criticized the Occupy Wall Street protesters for engaging in disruptive behavior. But it would seem to me that we generally have no qualms with the fact that The Boston Tea Party itself was vastly “more illegal” according to British Law. Whereas the Tea Party protesters appear to show up, protest against government, then drive home on public roads, OWS protesters are camping out–24/7. Both movements clearly had an affect on our national and political discourse, well as on the trajectory of policies. Amidst a weak and fragile economic recovery where private sector job creators were bearish on investing in job creation, the Tea Party was instrumental in shifting the focus to smaller government and reduced government spending (the only source for maintaining meaningful job creation). After 8+ years of wasteful spending under Bush, the Tea Party decided they’d had enough once Obama was in office. 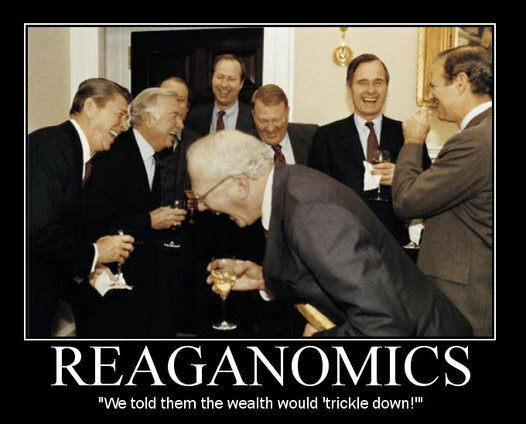 Now, the political discourse would revolve around a false impending debt crisis (which gave Republican obstructionists the ammo they needed to obstruct a faster recovery). The result? A paralyzed Congress that couldn’t agree to raise the debt ceiling and a subsequent lowering of the US credit rating. OWS was instrumental in getting the focus back onto the lack of jobs and furthermore, brought the increased disparity of wealth to the mainstream. 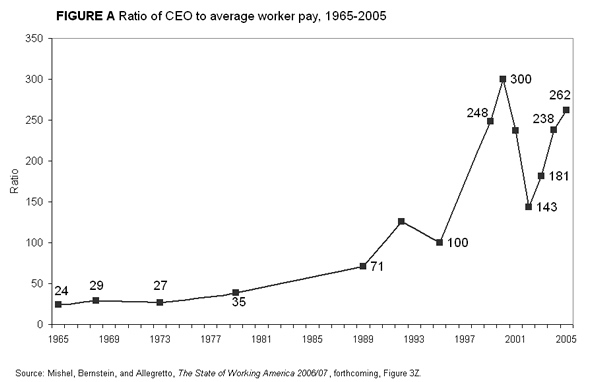 This disparity of wealth is a bulk of the reason for this slow recovery. Even as jobs slowly increase, the buying power of the middle class is too weak to support a faster and more sustained recovery. 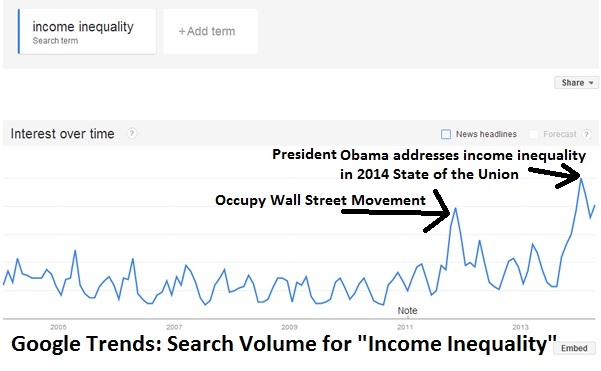 Search volume for the phrase “income inequality” shows a huge spike and subsequent overall increase after the Occupy Wall Street movement. In the 2014 State of the Union address, President Obama addressed income inequality, resulting in an even greater increase in searches for the phrase.